We’e all familiar with the ‘big names’ of the Roman Empire- the politicians, the emperors, the generals – ‘the posh ones’, as Mary Beard calls them. But it is rather less often that we meet the ordinary people who populated its cities, produced its goods, lived and loved and kept the mighty imperial machine ticking over. In this, the first episode of three, Cambridge’s Professor of Classics sets out to find the human stories behind the dazzling spectacle of ancient Rome. 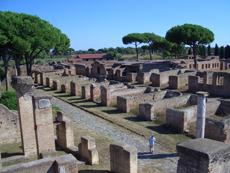 She does this with characteristically ebullient energy and earthy humour, cycling up and down the Appian Way to ‘get to know’ the people buried along its dusty sides. This personal approach really brings the past – and the people who populated it – alive. We are seeking the voices of ordinary Romans, and it turns out that – if you know where to look – they are surprisingly chatty. The Romans didn’t hold back when it came to writing epitaphs – not for them a simple inscription giving their name and dates. Rather, the Appian Way gravestones directly address passers-by, clamouring to share their life stories. With Mary Beard acting as interpreter we can hear their voices clearly – confident, self-assertive, conversational. There are some wonderful stories to uncover, both poignant and fascinating. We meet Carnuntia, the ‘babe from Carnuntum’, a 17 year old slave who was bought by a man who subsequently freed and married her. He brought his new bride back to Rome, but by 19 she was dead. And then there is Marcus Vergilius Eurysaches, a wealthy Greek baker whose fabulously tacky tomb shaped like a giant over is a shameless reminder of the opportunities Rome offered to outsiders. Also intriguing is Marcus Antonius Exochus, an Egyptian gladiator who played the part of a Thracian warrior in the arena and ultimately retired as a Roman citizen and family man. ‘That’s imperial Rome in a nutshell,’ Mary Beard smiles. And indeed, this programme demonstrates how vividly diverse the ancient city of Rome was; drawing on the population of an empire stretching from Scotland to Afghanistan, it was the most cosmopolitan city the world had ever seen. To be ‘Roman’ was not a fact of birth, we are told, it was ‘a vocation’. Mary Beard also offers a thought-provoking reflection on the different way we and the Romans think of multiculturalism. There were no separate cultures living side by side, she tells us, no Jewish quarter or Chinatown – integration was the name of the game. This caused little difficulty in Rome’s composite culture. 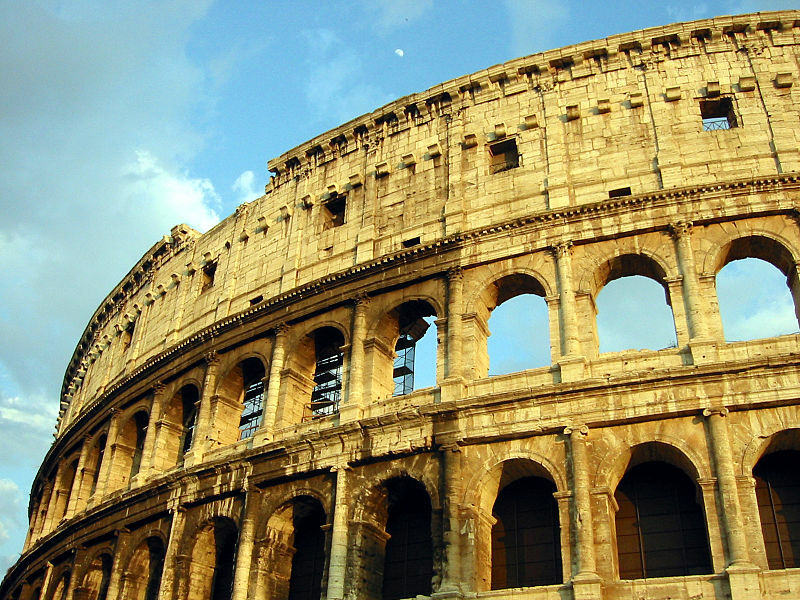 We are also shown the great commercial energy that fueled Rome. In some beautifully-shot scenes at Ostia, Mary Beard gleefully translates mosaics at the Square of the Corporations which – like ancient billboards – proclaim the professions of those who once traded there. Another staggering reminder of the economic forces at behind the empire is the Monte Tesstaccio – at first glance a hill, but in fact a 35m heap of millions of broken amphorae which once contained olive oil, one of the most important commodities of the time. On a more personal level, we can appreciate the huge range of jobs performed by ordinary Romans by returning to their gravestones, where their occupations are proudly displayed, clearly a key aspect of their identity. Here we find a mixture of the familiar and the exotic: pepper merchants, pearl sellers, warehousemen, overcoat makers, fishmongers, and even a purpurarius, a specialist dyer of purple whose produce was restricted by law to very elite clients. It’s a fascinating journey, and you could wish for no more knowledgeable or enthusiastic guide than Mary Beard. Her love for her subject and her delight in visiting these ancient sites is immediately obvious and very engaging. She describes triumphal processions and colosseum displays with such relish that you can almost see the scenes playing out before her. We also see her tracing inscriptions with her fingers, trying on a helmet and acting out gladiatorial fights with ancient figurines. This hands-on approach is very charming and a lot of fun. ‘Pleased to meet you, Prima,’ she says, midway through translating one woman’s gravestone, and departs another with an affectionate vale. Vale it is – but I’m looking forward to rejoining the professor for more of the same next week.